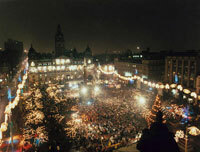 Hogmanay is the Scots name for the New Year's celebrations, which take place in Glasgow's George Square on the 31st of December and which often last well into the next morning. Tickets for Glasgow's Hogmanay are available online through Ticketmaster, by phone 08444 77 77 00 or in person at the Ticketmaster outlet in Buchanan Galleries. Big name music acts perform live and there is a spectacular firework display to mark the New Year. The Scottish tradition of singing "Auld Lang Syne" at New Year has passed to many countries. The original poem was reinterpreted by the famous Scottish bard, Robert Burns, and was later set to music.